While I felt want to eat Pizza somehow yesterday, I found a piece of salmon sold at half price. I recalled when I went to Ron’s place the very first time, he cooked a salmon dish for me. Yes, the dinner would be a salmon stake by 3years. I told Ron the dinner would be salmon when he was back, then he was apparently disgusting and looking for a fly of pizza delivery, but couldn’t. 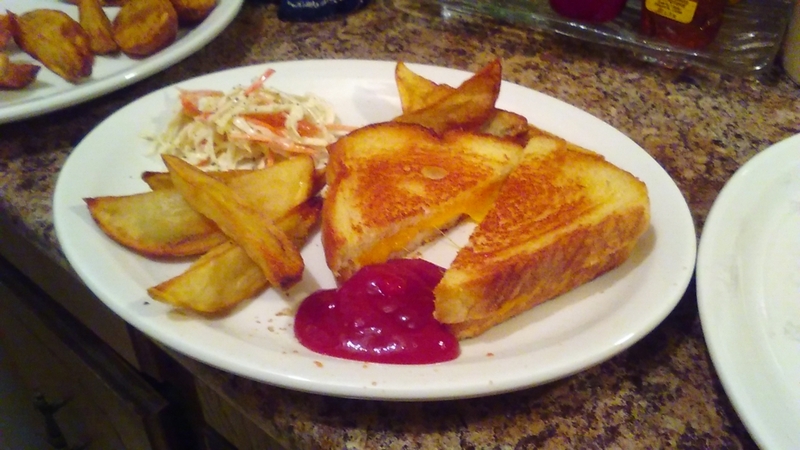 Then he recommended me to have an easy dinner, grilled cheese sandwich,　and I agree with the idea. By the way, I ponder how mystery the human’s body is; we wanted pizza almost at the same timing. Back to the cooking, potatoes for french fry were cut into big pieces, so it took a long time to be cooked. But their taste was good. Ron admired me, saying his late father would admire me as such a delicious french fry cooker. He usually eats french fry with vinegar and salt. This is a littile interesting for me. After the cooking, I asked him some questions about translation, in particular, how to understand difficult sentences. As usual, my way to ask question doesn’t make sense, even so, he patiently explains me again and again, usually with a lot of examples. Thank you for your big efforts and patience, and I am sorry for bothering you at your relaxing time. I always see his talent, once Ron starts speaking. His talk is always well organized, persuasive and powerful. He doesn’t allow me to cut him off. I am impressed.